The LightWave LC-LC Multimode OM1 Fiber Optic Patch Cable is a great option if you need to move a lot of data across a shorter distance, while maximizing port density in the process. 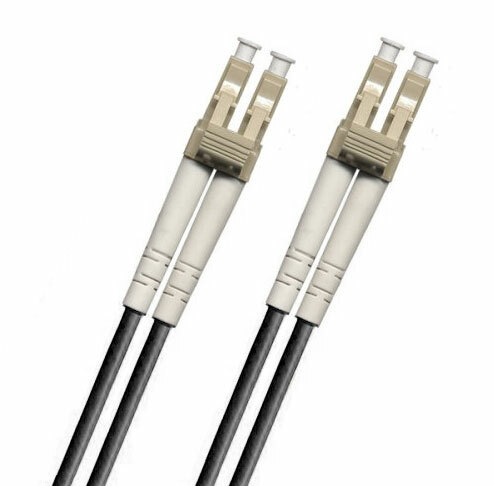 Like the ST Cable, the LC fiber optic connector is easily terminated, but uses a ferrule half the size of the ST and other standard connectors at 1.25mm, making it a great space saver. With its OM1 capability, this LC-LC cable will bring you data transfers over a 1Gbps link with a 62.5/125 micron glass fiber over a distance of up to 300 meters at a wavelength of 850nm, and over a distance of up to 550 meters at a wavelength of 1300nm. For a 10Gbps link, you can transfer data over a distance of up to 33 meters at an 850nm wavelength.